This entry was posted in Social Networking and tagged game streams, justin tv, live stream, twitch api, twitch chat, twitch embed, twitch tv, video chat, video embed on September 4, 2015 by Vera Jaman. Works for any E-commerce plugins like WooCommerce, WP-e-Commerce,Easy Digital Downloads or Jigoshop. 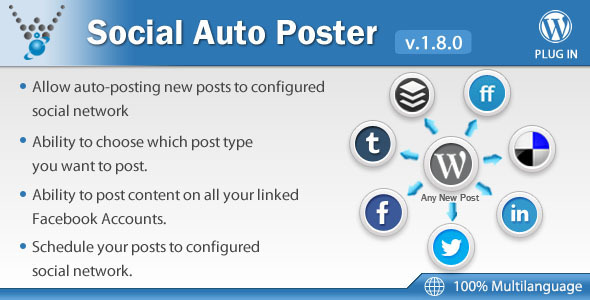 This entry was posted in Social Networking and tagged automation, BufferApp, delicious, facebook, friendfeed, google, integration, linkedin, networking, poster, social, syndicator, tumblr, twitter, woocommerce on September 3, 2015 by Vera Jaman. 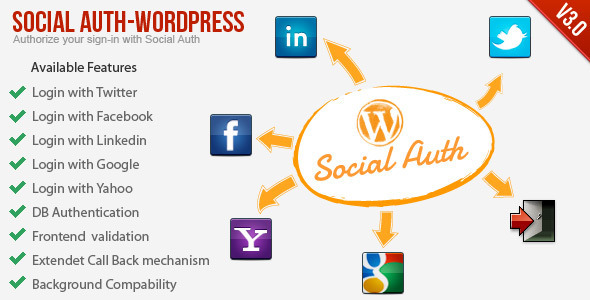 Social Auth WordPress Plugin v3.3 released! What is new in v3.3? This entry was posted in Social Networking and tagged facebook, facebook login, google, google login, linkedin, linkedin login, social authorization, twitter, twitter login, wordpress, yahoo, yahoo login on August 20, 2015 by Vera Jaman. Why Jet Tweet? 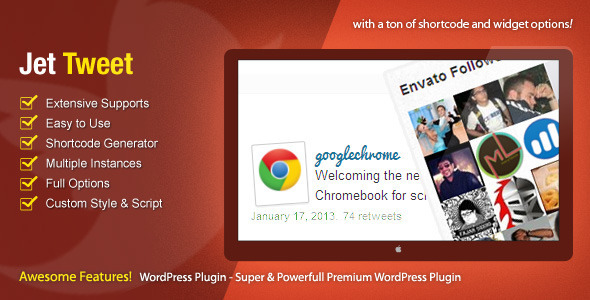 This plugin is not only for displaying tweets, but also bring Twitter to your site. 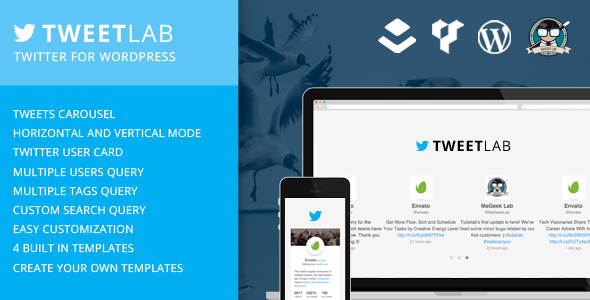 Since version 2.0 and Twitter API v.1.1 has a set of changes to the features. This plugin comes with a ton of visual options and easy to customize. Uses the powerful Twitter api such as mentions timeline, user timeline, user list, mentions, home timeline, retweets of me, retweets id, show tweet by id, oembed, search tweets, favorites list, and lists statuses. You can built your own twitter template(s) with just simple steps, customize the stylesheet, and even share the template to other peoples. With the new feature tweet dashboard widget, read your home timeline, mentions or messages. Reply a tweet or message, favorite, or retweet it directly from the dashboard widget. New feature Tweet dashboard widget for home timeline, mentions and messages. 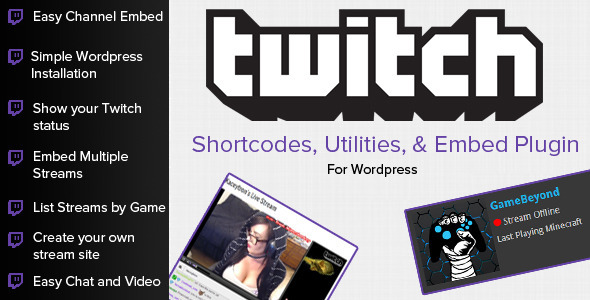 Multi option shortcode and widget. Optional name of list belonging to username. Optional avatar height and width. Text before and after your tweet. This entry was posted in Social Networking and tagged ajax, api, favorite, feed, follow, follower, hashtag, jquery, Mention, message, retweet, shortcode, tweet, twitter, widget on July 23, 2015 by Vera Jaman. Cool animated button hovers! – Fallback to CSS hovers for unsuported browsers! 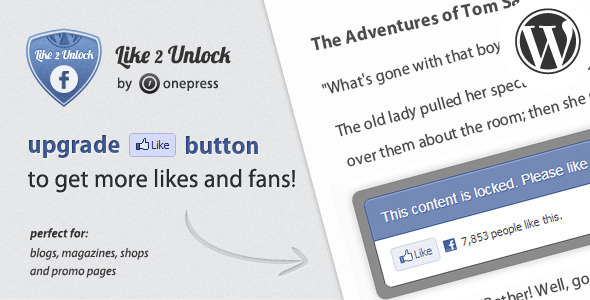 Each button can be customized with it’s own settings such as page URLs, which buttons to show, etc. Slick drag and drop to order buttons! 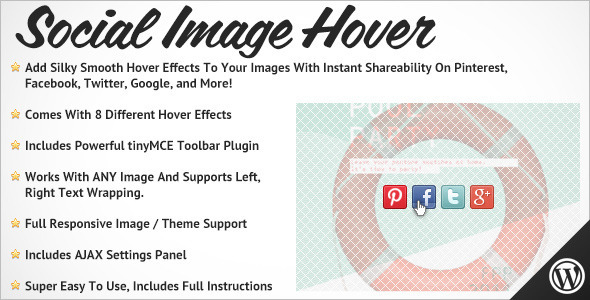 Includes 8 different image hover effects / overlays! Can be applied to any image, supports left and right text wrapping. Optional close button that allows users to remove Social Hover with some cool effects for easy access to the image to download, copy, etc. This entry was posted in Social Networking and tagged facebook, facebook share, google, google plus, hover, image hover, jquery, Pinterest, social, social media, twitter, wordpress on July 1, 2015 by Vera Jaman. This entry was posted in Social Networking and tagged Content Locker, facebook, facebook 2.0 api, jquery, like, like button, like locker, like to read, like to unlock, plugin, SMO, social, social media, traffic, wordpress on June 17, 2015 by Vera Jaman. Combined reach of over 1.8 BILLION social media accounts. 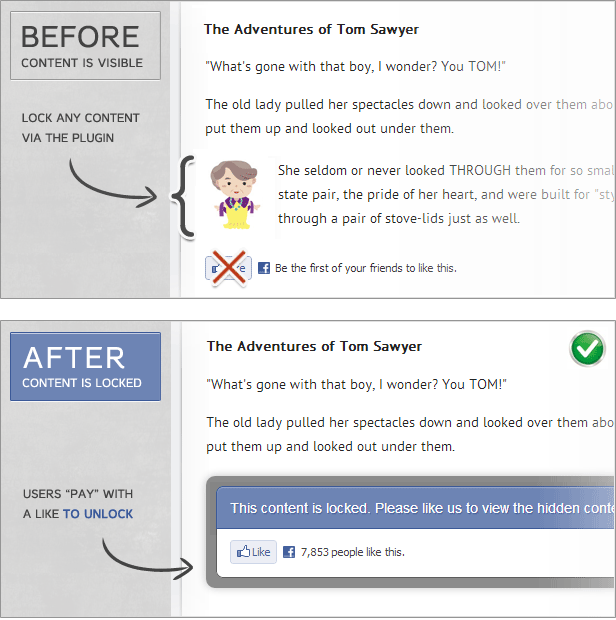 Completely locks all page usability until popup is closed or a social action is completed. Popup stays centered as the user scrolls up and down. Smart Mobile support runs on all mobile devices and tablets that allow it! Optional advanced close features allow visitors to close the popup by clicking outside of the popup area or by pressing the escape key. Cookies remembers which users have not completed a social action. All buttons can be completely configured with their own settings! Configure everything from the beautiful built in settings panel. Set background opacity right from the settings. Works on all sites big and small. Works on all large screen mobile devices. This entry was posted in Social Networking and tagged facebook, follow, follow button, google, Google +1, like button, popup, traffic pop, tweet button, twitter on June 16, 2015 by Vera Jaman. Fullscreen Layout Mode – This view mode turns your site into a fullscreen gallery using either you Instagram photos or photos of your own. 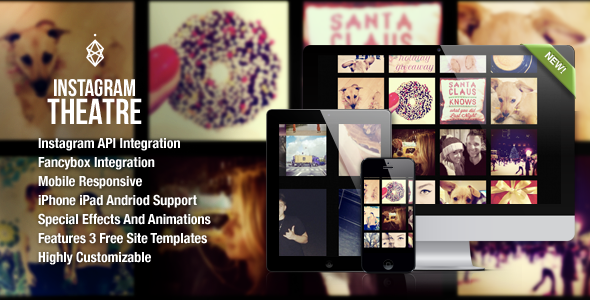 Thumnail Layout Mode – This view mode creates a really cool grid like layout for your photo gallery. When a user clicks on a photo, a larger version of it expands in a fancybox! List Layout Mode – This view mode displays your photos in a list format. When a user hovers the photos, a rollover effect pops up reveling information about the photo including, author, time-stamp, caption and the number of likes. Popular Instagram Feed Mode – This feed mode pulls in the photos from the Instagram popular feed. Tag Instagram Feed Mode – This feed mode allows you to specify a tag to search from the Instagram API. User Instagram Feed Mode – This feed mode allows you to specify a user id to pull in photos from a specific user. Multiuser Instagram Feed Mode – This feed mode allows you to specify multiple user id’s to pull in photos from specific users. Note, this feature does NOT allow load more functionality. Location Instagram Feed Mode – This feed mode allows you to specify location id to pull in all photos taken in a given location. Mobile Responsive – This plugin is fully responsive for mobile devices. 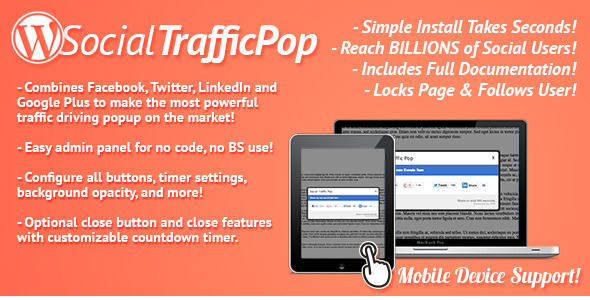 This plugin scales down to accommodate you typical devices including iPhone, iPad, and Android. Launch the demo and try it yourself. Customization – This plugin features an array of options for customizing your experience such as effect speed, delay interval, and alternate layouts. Upon purchasing this plugin, you will be provided excellent support and we’re always open to feature requests and contract work. In addition, this plugin comes with a three site templates for the different layout options. For the advanced users, feel free to use my CSS in your WordPress installation. This entry was posted in Social Networking and tagged instagram, instagram gallery, instagram theatre, photo, photo gallery, photos, simple instagram, social media, wordpress, wordpress instagram on June 13, 2015 by Vera Jaman. 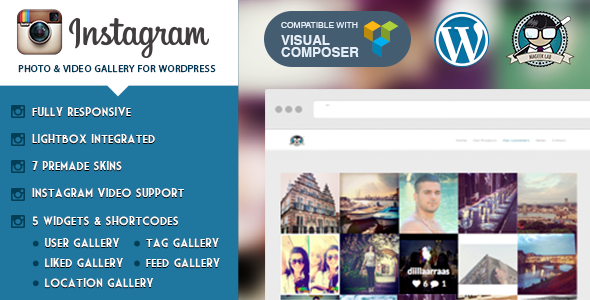 This plugin allows you to show the last photos of an Instagram user or tag and comes with several options to configure and wigets ready for your sidebar! It’s fully Responsive! Set up in five minutes following the documentation step by step. This entry was posted in Social Networking and tagged filter, gallery, hastag, hipster, instagram, network, photos, plugin, social, tag, user, video, visual composer, widget, wordpress on June 9, 2015 by Vera Jaman.